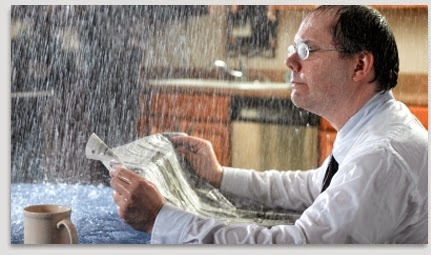 One of the most common and expensive issues homeowners call a contractor for is to fix a leaky roof. However, even for a pro, the source of a leak in your roof can be elusive because it rarely matches where the water is entering the home. Your contractor then becomes an investigator trying to identify the source of a leaky situation and determine the path in which the water is traveling. The good news here is that all of this frustration can be avoided by following a proper maintenance program that should be performed at least twice a year to help avoid future problems. Before an inspection, ensure you take a look around from the ground level and make your contractor aware of any recent extreme weather, leaves, falling debris, trees, animals around the home, satellite or cable work, or additional accident causers that may have damaged the roof. Once on the roof, keep these 5 simple tips in mind so you may locate future leaks and problem areas before they cause further costly damage. 1. On Edge. Drip edges are not only aesthetically pleasing, but are highly important in ensuring water is kept away from the fascia and directed away from the roof. A bonus is that they also help to keep out insects, snakes, and critters. Always check your drip edge when looking for leaks. 5. The Gutter Counts When it Comes to Your Roof. Most homeowners completely underestimate the value of their gutters. They must be installed and sloped correctly to drain, free of debris, and tightly fastened. Contractors should always stress to homeowners the importance of gutter maintenance and that it should be left to a professional. This is our basic list of maintenance suggestions, however, Trudel and Sons Roofing offers a full comprehensive roof inspection when quoting or beginning a contract. A thorough inspection, performed regularly by a professional roofing contractor, can monitor the roof's condition and help prevent small problems from becoming major roof leaks.